As a Bin Box Manufacturer in India, we offer the optimal quality Giraffe Box Pallets / Metal Bins boxes / Flat Pallets in the domestic as well as global market. 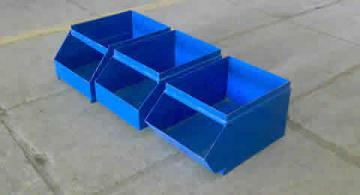 The Box Pallets / Metal Bins boxes / Flat Pallets that we manufacture is available in in various range and specifications with high load capacity. The metal bin boxes and box pallets are available for our customers in customized shapes, sizes and specifications fa bricated as per the custom requirements The metal bin boxes, manufactured by us are one of the most durable metal bin boxes, and built to deliver sustanined performance for heavy duty storage application. Our Bin Boxes portfolio comprises of vast range, it can match all you requirement of storage solutions pertaining to “Heavy Duty Bin Boxes”. Smooth edges making each bin boxes safe in use.